Super Height Rock Wall, comes level with the 2.1m high deck on the Home Front Mountain range, or it can be used as a vertical wall on the Jungle range. Super Height Rock Wall for Jungle, Mountain & Cosmic, comes level with the 2.1m high deck on the Home Front Mountain range, or it can be used as a vertical wall on the Jungle range, and then comes up level with the height of the top of the side walls. 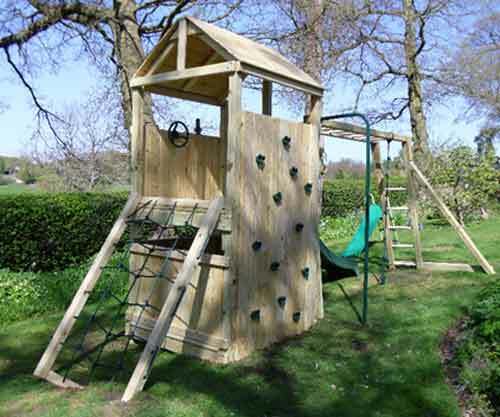 Fitting the Jungle, Mountain and Cosmic ranges, it is available only when purchased as part of one of these Climbing Frame sets. The picture above shows it at a slight angle meeting the 2.1m high platform of the Mountain Tower. Please see the picture below for an example of it on the Jungle Tower vertically.